In 2-quart saucepan, heat 1 1/4 cups water and the rice to boiling. Reduce heat to low; cover and simmer 10 to 15 minutes or until tender. Transfer to large bowl, tossing rice with chopsticks or 2 forks to cool slightly. Gradually add 1/4 cup vinegar to rice, tossing constantly. Cover bowl with damp towel; cool rice to room temperature. In small bowl, mix dressing ingredients with wire whisk. Dip hands into cold water; divide rice into 4 equal portions. Form each into oval-shaped patty about 3/4 inch thick. Roll edges in sesame seed. Place each patty on serving plate. 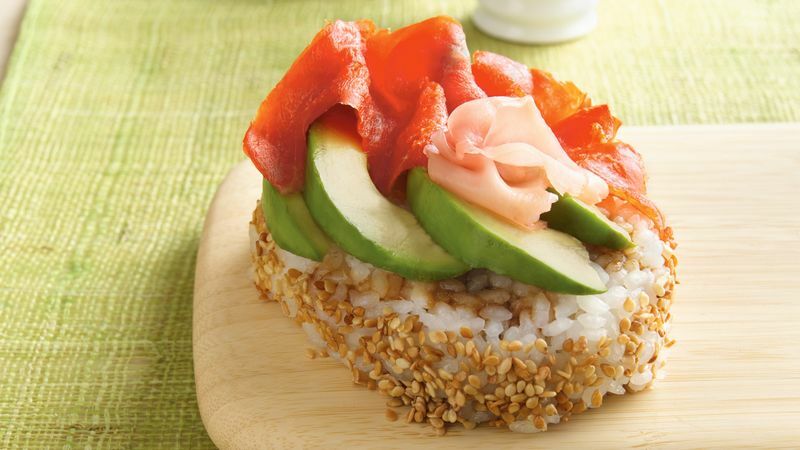 Sprinkle top of each rice patty with 1 to 2 teaspoons dressing. Arrange 4 avocado slices over each. Top each with 1/4 of the sliced salmon and 1 teaspoon ginger slices. Serve immediately. Look for sushi rice, wasabi paste and pickled ginger in the Asian section of the supermarket. This short-grained rice may be called pearl, glutinous or Japanese rice. Give your salad an exotic look by substituting black sesame seed for the toasted sesame seed. *To toast sesame seed, sprinkle in ungreased heavy skillet. Cook over medium-low heat 5 to 7 minutes, stirring frequently until browning begins, then stirring constantly until golden brown.